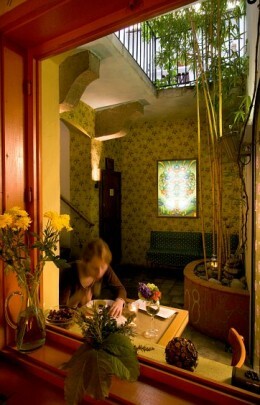 Lehka Hlava (Clear Head) is a smoke-free vegetarian restaurant minutes from the Charles Bridge and the well trodden tourist paths of Prague. Yet it’s discreetly hidden in a romantic lane way that’s obscure enough to avoid the pedestrian mayhem that affects much of the city. That’s not to say that Lehka Hlava is an undiscovered gem, it’s a very popular spot for those in the know, the prices are excellent and thus reservations are absolutely recommended. So if you’re sightseeing or just looking for a really tasty meal that doesn’t involve Smoked Meat, Sausage or Schnitzel, then this is the place for you. The menu is diverse and like I said, tasty. A range of vegetarian dishes from the yummiest cuisines are on offer - Lebanese, Spanish, Thai, Italian, Japanese, Mexican, Indian etc. Depending on your appetite you can stick to a range of Tapas, Houmus, Red Lentil Soup or large fresh Salads with ingredients such as Goats Cheese, Tofu and Seaweed. Or if you’re after something more substantial try out one of the Quesadillas or an Asian speciality such Thai Red Curry with Rice. 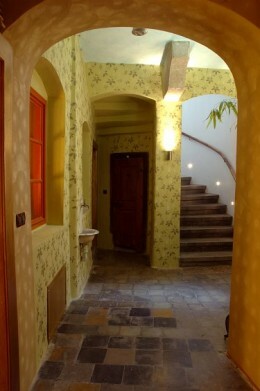 The desert menu is generous and decadent and a range of drinks are available from fresh mint tea to beer and wine. Mmm I’m making myself hungry just writing this all down! The great thing about Lehka Hlava is that it’s smoke-free and they have 3 dishes especially for kids - Pasta with Basil Pesto, Walnuts and Cream, Pasta with Tomato Sauce and Lucie’s favourite Rice Pudding with Apples, Raisins and Cinnamon (she has to stop us from attacking her plate, adults will enjoy finishing off any leftovers!). There is just one high chair that I’ve seen, possibly another exists but alas no baby change facilities (there are just two small toilets on the premises). 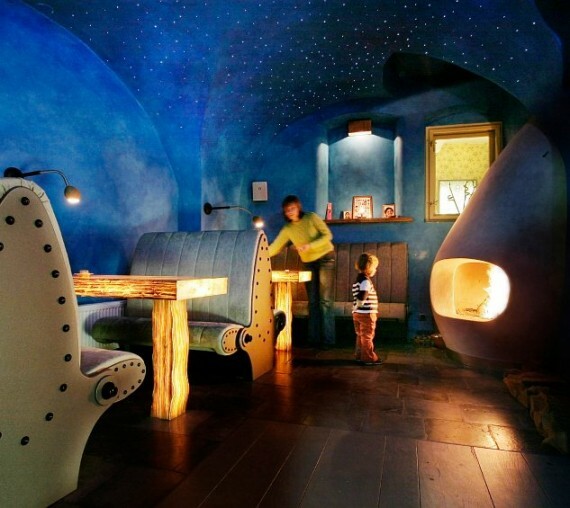 Lehka Hlava is divided into two dining spaces, spectacular is the back room where the ceiling is painted dark blue and lit by small fibre optic lights - giving the effect of being under a star filled sky. 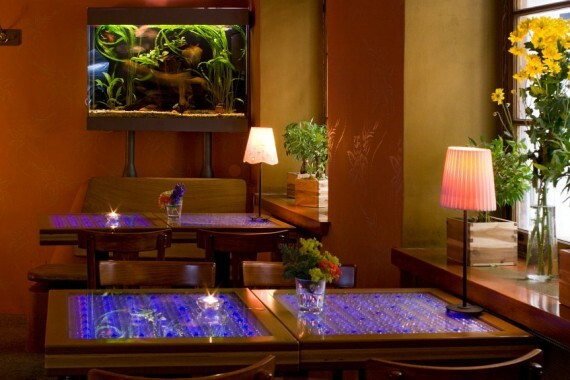 The second dining area faces the street and has fibre optic cabling set into the tables and an aquarium. The interior design is artistic and pleasing to the eye and the wait staff are always really friendly despite the popularity of the place and busy turnover of clients. And if you’re child-free on a night out and ready for a drink then I can highly recommend the laid back old school cool bars in Karoliny Svetle just around the corner (be warned though, they ain’t smoke free!). Lehka Hlava offers a daily lunch special of soup and a main dish for 105 CZK and they also have regular Sunday Brunches that they advertise on their website. I’m not sure how that would work, the space is quite tight in there. If any of our readers have tried it out can they share with us below? OPEN: Monday to Friday from 11.30am till 11.30pm, Saturday to Sunday 12pm till 11.30pm. Note: from 3.30pm till 5.00pm warm meals are unavailable. DIRECTIONS: By Tram take 17 or 18 to tram stop Karlovy Lazne or trams 9 or 22 to Narodni Divadlo, in both cases walk down Karoliny Svetle to Borsov Street. By Metro you have several options, catch the green A line to metro stop Starometska or Mustek or take the yellow line B to Narodni Trida.